The middle one for makeup or body lotion, the large one for toiletries, fully use them as you like! Superior Quality: Our clear toiletries bag is made of high quality PVC material that have excellent abrasion resistance and high resistance to insects, fungi, animals, as well as molds, mildew, rot and many chemicals which can provide long-term using experience. Improved Design: This toiletry bag is using sturdy smooth zipper, large zipper opening and luxurious zipper puller make it easy to open and pack. It is corrosion-resistant and more durable than those inferior zip-top bags. Find Items Faster: The transparent design allows you can easily to see what's inside and find what you need in a minute which is pretty useful for Airports especially when going through security. Waterproof and Easy Cleaning: Our travel toiletries bag is waterproof that the surfaces can keep items free from moisture and dirt, simply wipe clean and air dry as needed. 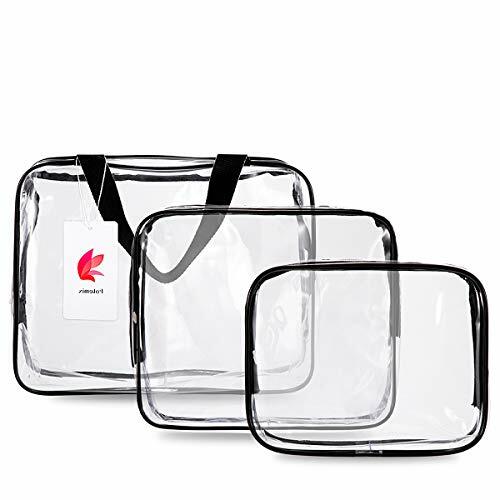 Widely Used: Our clear makeup bag comes with 3 different sizes that can be used as small storage bags for home, travel, business, even the stationery bag or school bag. You can easily put into liquids, shampoo, lotion, perfume, cosmetics, medicine, stationery and other small items of your choosing.